From an early age Lewis Hamilton attracted attention as a potential F1 champion and he did not disappoint. In his maiden season he missed out on the championship by a single point, but secured it the following year to become the sport's youngest world champion at the time. However, the past three years have been more of a struggle after McLaren produced a dud with its 2009 car and Hamilton made a number of mistakes towards the end of the 2010 season which continued throughout the whole of the following year. Too many collisions and off-track distractions meant he was beaten by a team-mate across a whole season for the first time in F1, but his impressive wins in China, Germany and Abu Dhabi ensure that he will be one of the favourites for 2012. Hamilton took his first steps towards F1 in 1993, aged eight, when he started karting at Rye House Kart Circuit in his home county of Hertfordshire. By ten he was British Champion and on collecting his award at the Autosport Awards Ceremony, the youngster approached McLaren team boss Ron Dennis and told him, "I want to race for you one day." Dennis wrote in his autograph book that he should "give him a call in nine years". Less than three years later Dennis signed Hamilton to the McLaren Mercedes Young Driver Support Programme with the intention of developing him into the ultimate racing driver. The funding enabled Hamilton to progress to single-seaters and the Formula Renault series in 2002, a championship he won in his second year with two rounds remaining. In 2004 he moved up to the Formula 3 Euroseries and again in his second year took a dominant win. He followed this up by winning the GP2 series at his first attempt in 2006 with Nelson Piquet Jr as his only real opposition. After the departure of Kimi Raikkonen to Ferrari and Juan Pablo Montoya to NASCAR, McLaren found themselves requiring two drivers for the 2007 season. In November the news came that the racing fraternity had long been expecting - Hamilton would drive for McLaren in 2007 alongside Spaniard Fernando Alonso. Although stunning, Hamilton's first season in Formula One was not without drama. He regularly outperformed reigning world champion Alonso, standing on the podium after each of the first nine races. He scored his first race win in Canada, and followed it up one week later with his second at the US Grand Prix. Leading the championship, Hamilton was now being billed to do the unthinkable and win the world championship at his first attempt. After a mixed second half to the season, which saw heavy crashes and conflict with Alonso, the teams arrived in Brazil for the final race of the year. Hamilton was leading Alonso and Raikkonen by four and seven points respectively and lined up ahead of both of them on the grid. He could have so easily taken the championship but a gearbox issue early in the race dropped him down the order and resulted in him missing out on the title by just one point. With Alonso heading back to Renault for the 2008 season, harmony was restored at McLaren. Once more the season went to a final-race decider in Brazil - this time Hamilton arrived with a seven-point advantage and needed to finish in the top five to win the title. As rival Felipe Massa crossed the line to win the race Hamilton was sixth, but moments later he put in a last-gasp move on Timo Glock - who was struggling on the wrong tyres - to finish fifth and take the title by a point. If his first two seasons in F1 had been a dream for Hamilton the third could be seen as a nightmare, only managing to score nine points by the tenth round of the season. Aero changes to the underperforming McLaren for the German Grand Prix showed promise, and he took two wins and two podiums in the last half of the season. Contracted at McLaren until the end of 2012, Hamilton was linked to a move away during 2011 but insisted he sees his future with the team. However, after another season in which McLaren was unable to challenge for the championship, Hamilton's patience appeared to be running out. 2012 started in promising fashion with two pole positions and three consecutive podiums, but slowly the pace-setting McLaren was overhauled and mid-season cracks started to appear. 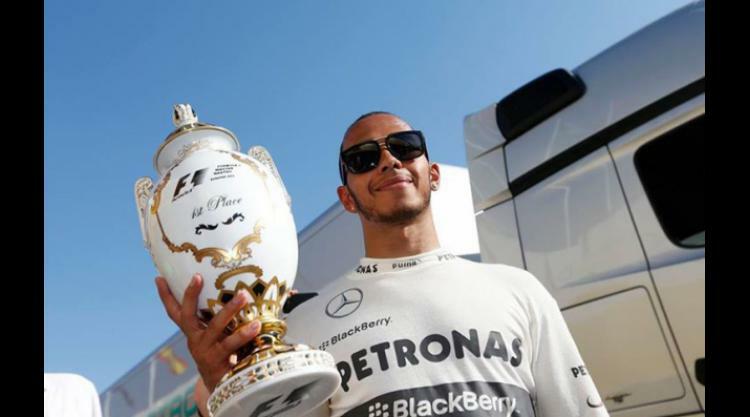 At the end of September it was announced that Hamilton would join Mercedes from the 2013 season in search of better value and that elusive second world championship. Hamilton's driving style has always ensured he stands out from the crowd, with the confidence to attempt overtaking manoeuvres his rivals wouldn't even consider. His preference for a car set up to oversteer shows off his lightning reactions, but his desire to win every race can often backfire when he crashes out trying to gain a place rather than collecting safe points. Winning the world championship in 2008 after missing out by just one point in his debut season in 2007. Being disqualified from the Australian Grand Prix in 2009 after being found guilty of "misleading the stewards" over a yellow flag incident with Jarno Trulli. "I have no fear of death, so I don't think about it. I love the adrenalin kick that danger brings. Others get their kicks bungee jumping from tall buildings. I'm very, very competitive. I want to be the best at everything I do. It's not just driving - it's everything - it might be playing my guitar, I try to be the best at it as I possibly can." Hamilton is the proud owner of three Blue Peter [a British childrens' TV show] badges - he received his first aged six when he appeared on the programme to drive remote control cars, his second and third aged 12 and 16 for karting.